It is hard to find any trend at all at the national level, although Barack Obama's position improved has incrementally in a couple of the national trackers. Indeed, our model now perceives that the popular vote has been flat for roughly the past two weeks. It seems almost as though voters made their collective decision after the second presidential debate on October 7 -- perhaps Obama's clearest win of the series -- and decided on behalf of the Democrat. Meanwhile, John McCain is running into some further problems at the state level. In Colorado, a Rocky Mountain News poll now has Barack Obama 12 points ahead; McCain had led by 3 in the RMN poll in August. 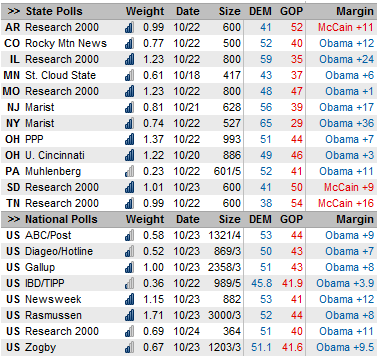 Obama also leads in two polls out of Ohio; PPP has him ahead by 7, and the University of Cincinnati / Ohio Newspapers Poll, which had shown him trailing by 2 earlier this month, now shows him ahead by 3. Obama, at least, does not look to be competitive in South Dakota or Arkansas. It will be very difficult for Obama to win more than about 397 electoral votes, which is where he'd end up if he wins all the states where we currently have him favored, plus North Dakota, Montana, Georgia, and Nebraska's 2nd Congressional District. Obama would have to win West Virginia to break the 400 barrier, and I don't see that happening; the other long shot is Arizona, which hasn't been polled in some time. John McCain's win percentage is now 4.3 percent, down from 5.1 percent yesterday.